Four seemingly unrelated cases baffle FBI agents Sherlock and Savich in the 21st entry in the series. A woman is held hostage in her house by a dirty and confused man who says he only wants to protect her. A killer is rescued from his initial prison transport and disappears. A newborn is kidnapped from a hospital. The son of a US Senator is suspected of murdering his girlfriend but he has no memory of the event. There are many plot strands in Enigma that are woven together expertly. Ms. Coulter is obviously an experienced thriller writer. I particularly enjoyed the scientific aspects of the plot. There hasn’t been a good science thriller since Robin Cook and Michael Crichton died. Enigma eventually evolves into a fascinating exploration of anti-aging technology. 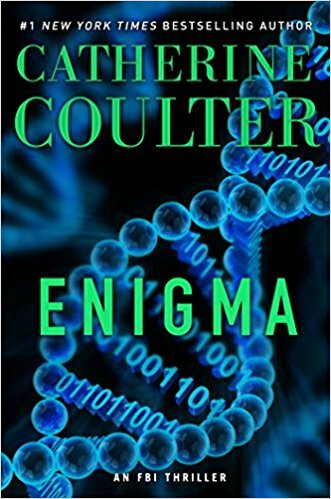 I would recommend Enigma to anyone who likes to read FBI procedurals or scientific thrillers. It is not necessary to read any previous entries in this series to enjoy this novel. Thanks to the publisher, Gallery, and netgalley for the advanced review copy in exchange for my honest review. Enigma will be available September 12, 2017.